Happy birthday D. J. Chaconas (A Hat for Lilly), Avner Katz (The Little Pickpocket), Jonathan London (Froggy series), and Peter Sís (The Wall: Growing Up Behind the Iron Curtain). March has been designated Women’s History Month and the Almanac features many titles, such as Laurie Halse Anderson’s Independent Dames that address the topic of women and history. But while hunting for a different slant on an author study for the elementary level, I realized there might be another way to approach Women’s History Month. What if instead of focusing on female historical figures, I focused on the female writers and illustrators who create books for children about history? When that concept comes to mind, I can recommend no better illustrator study for the month of March than Melissa Sweet. 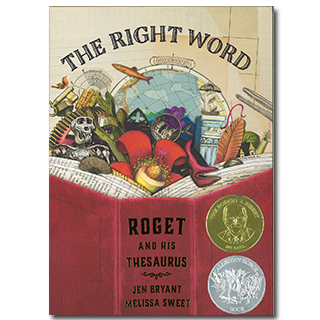 Melissa has created a group of glorious titles from Girls Think of Everything, Brave Girl, and Balloons Over Broadway, and last year she teamed up with writer Jen Bryant for The Right Word: Roget and His Thesaurus, winner of a Caldecott Honor and the Sibert Award. Bryant’s sprightly text explores the life of Peter Mark Roget, the early death of his father, and his need to make lists of all the words he found. The Carl Linnaeus of words, Roget wanders through London parks, making lists of plants and insects. And although he becomes a doctor and renowned scholar (who also invents a portable chess set), Roget remains true to his first love: words and how they fit together. In his 70s he published the book that would make his name a household word. But as fine as this text is, in the hands of another illustrator The Right Word would not grab the reader’s attention as it now does. Melissa Sweet’s ability to create history with engaging characters brings the book to another level. By taking old botanicals, vintage papers, red leather, book covers, and collections of hot type and combining them with watercolors, Melissa Sweet provides a visual delight of collage on every page. In fact, the book shows a process that could inspire any budding artist to craft illustrations about an historical figure. Although all of Melissa Sweet’s work is immediately recognizable, she has a knack for finding just the right way to present those who lived in the past in their own terms. So the hot type she gathered gave her the material to litter this book with the kind of words, glorious words, which Roger collected. In this month that celebrates women, thank you Melissa for bringing so much history to life and creating the kinds of books that make children want to read about the past. 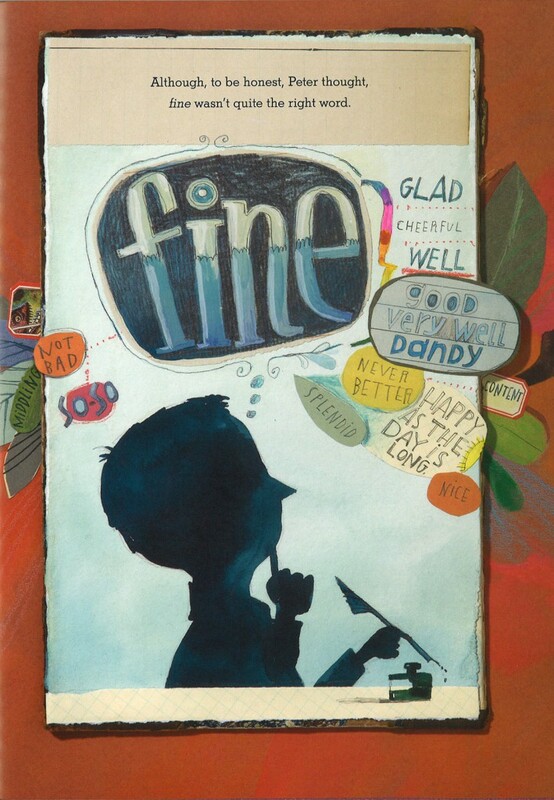 If you are a lover of words and you do not own a copy of The Right Word, do not hesitate to lose yourself in the pages of this totally satisfying picture book. Originally posted March 11, 2015. Updated for . One of my favorite books that I’ve read the last few months. Perfect for a word nerd like me! I didn’t realize Sweet illustrated Balloons Over Broadway, another one of my recent favorites. She’s definitely an inspiring woman I’ll need to keep an eye on. Thanks for sharing! Thank you, Anita. I’m honored to be a part of Women’s History Month. Here’s to budding logophiles of all ages! How did I miss this gem! I’ve ordered it, and I have that feeling I get when Anita has lead me to something really great. (Often inflicts havoc in my checking account.) I like the whole idea of the story. And that art! Woo-hoo! I can’t wait to get my hands on this. My art classes are out for Spring break and this is just what I need. Thanks so much for this wonderful post, Anita! Melissa & I have relished the chance to share Peter’s story with readers of all ages. What a legacy he has left us . … and what a gift it has been to work on this project with the marvelous Ms. Sweet!